In this article you will learn how you to control greed while trading. Your biggest enemy as a stock trader is nobody else but your own greed and fear. Today lets learn to control greed. Keep such timely articles coming – it only adds to the strength of the trades that we take as per what has been taught in your options course. Today, I want to touch upon the often repeated maxim, “Ride your winners and cut your losses”. Indeed, I know that greed has to be under control as you have very rightly stressed above – there is no denying that, but say for example, if one has cut his losing trade immediately, but is riding (carrying) his winning trade as should be the case. In such a scenario, where does one draw the line as far as greed is concerned. Would carrying the winning trade tantamount or be inferred as greed? And should the person get out even as the going is good? Or does the maxim apply more to Investment rather than Trading? In simple terms how does one stick to the above discipline, and yet not be labeled greedy? Well first of all a Big Thank You Allen for this question. After all we all are trading to make money. One can easily say we all are greedy so we should not trade. And if do not get greedy we do not make money. 🙂 So where to draw that line where we do not greedy and lose too much money? In this article I will try to clear the dilemma (confusion) what I mean when I say do not be Greedy when trading. Its just not me – all the experts and experienced professionals say that all over the world to traders, the same thing – just don’t be Greedy. Well this is the most important and very difficult emotion to control. Greed is one of the main reason why people lose money trading. Not just share trading – it is one of the biggest reason why companies fail, people lose a lot of money trading real estate and taking a pure gamble in any field to make money fast without working hard or speculating. Since I cannot talk about other fields let me confine myself to where to draw the line on greed when it comes to share trading and F&O trading. Lets suppose your friend made good return on investment in an IPO (Initial public offering) and told it to you. Or maybe you read stories on people making huge money on listing day of an IPO. Now you also start dreaming. You start reading newspapers for the next IPO. You start imagining that in the next IPO (whichever company it is does not matter) you will invest 1 lakh and make 1.10 lakhs on listing day and will inform about it to your friends. Here greed is taking control of your emotions. You see even if correct you will end up making only 10k or even less. You have already decided that you will exit the stock on the listing day itself and you are “sure” that you will make a profit because your friend or someone made it. You are not even thinking that 10,000 will not change your life anyway but you still want to be in the club of people making money on the listing day. How strange is that? You don’t want to do any research on the next IPO. The greedy in you thinks that every IPO is same where you can make money fast. You don’t want to be left behind. You also want to be a small part of the success story that you usually read in the newspapers. Same can be said for shares. When we see a stock falling 10% we buy it thinking within days it will bounce back – only to find it going even further down. This clearly was greed which you should learn to control. How to Control Greed Buying Shares and Profit? Lets say you have decided to invest 30,000 in a share for the short term for a quick profit. You wait for a correction and it has arrived. You should invest only 15,000 in that share. 1. The stock falls 10%. At this stage exit with Rs. 1500 loss. Its worth to note that had you invested all 30000 at that stage you could have lost 3,000. 2. The stock gains 10%. Now buy stock worth 5000 more with your stop loss at the price you entered the stock. If that happens your loss is only 500. But if the stock moves up 10% more buy more worth 5000. Now your stop loss is 10% below it. If it goes there you exit with a profit of Rs. 1000. Now if it goes up another 10% add some extra. Now if it goes below 10% you exit with a 3000 profit. In fact you can continue it as long as you want. Can you see how mathematically you are riding your profits WITHOUT greed and cutting your losses? 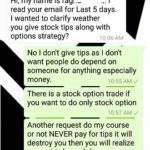 Had you entered the stock with 30k – you could have either made a profit of 3k or loss of 3k. So if you are 50% of the times right – you break even. 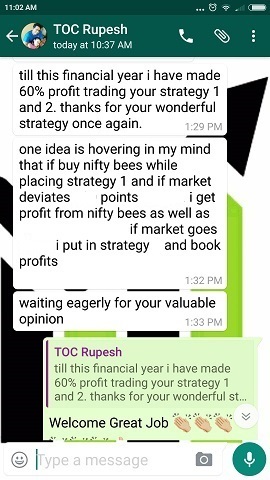 But in the above strategy you can make amazing profits if you are correct even 50% of the times. See how you controlled greed still made amazing profits. Now coming to F&O trading. Most of people reading this fall under this category. The real problem here is speculation. How many times we have seen an option worth 10 goes on to become 100 in a few days? Many times. Whenever that happens we start thinking – oh I missed this opportunity, but next time for sure I won’t. When that person makes money in his first trade probably played with one lot – he increases the trade amount by 5 times thinking he can make windfall profits every time he plays – that unfortunately never happens. And that’s how the series of losses starts. And here is the worst part. When you see an option priced 10 becoming 100 your brain thinks that had you invested ALL the amount you had in your bank account it would have multiplied 10 times in only few days. It doesn’t stop here – you tend to dream that you can then double or triple that amount every month and become very rich very fast. In quest of doubling or tripping our money very fast we actually become poorer and poorer in every trade and every month passing by. Unfortunately that hope never dies. There is another thing. Fear is another destructive emotion. How many times you bought an option for 30 – 40 odd points and sold it at 50 or 60? 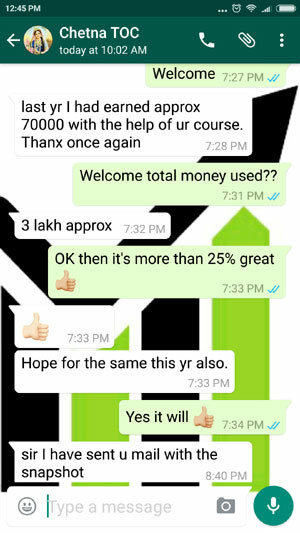 When you got an opportunity to actually double your money in that trade – you decided to book profit thinking even this small profit may get into losses because of fear. What I am trying to say is that your one trade that you were looking for all your life – that one trade that will cover all your losses and turn your account into huge profit will never ever come. Its not that those trades are not there – they are there every month – the problem is you do not have a plan – the only emotions ruling you are greed and fear – and they are the main cause why you are unable to make profits in the options game. So How to Control Greed (and Fear) While Trading Future & Options? Lets go back to Allen’s maxim: Ride your winners and cut your losses. You know what that is? Its a PLAN. Its just a plan that you need to plan. 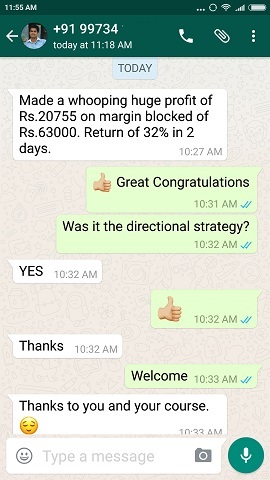 I have had a customer who was sitting at one crore loss trading Futures. Too many lots shorted naked and averaging them whenever Nifty rose 100 points. Unfortunately from 6000 to 9000 – the rally did not stop. His life’s savings gone. Isn’t greed to be blamed? What if he had a plan like taking a stop loss at one lakh or even 5 lakhs. What if every time is shorted a Future he also bought a ATM Call option? Today he would be left with 95 lakh to trade and get back that money and make a profit. 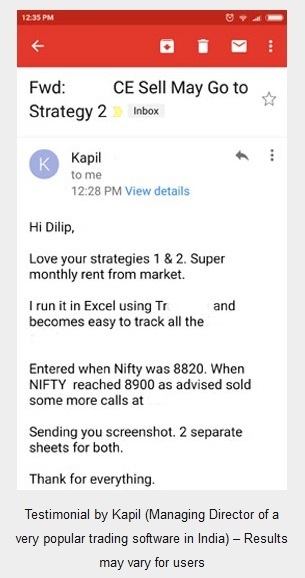 Instead he was pleading me to teach how to make 2% a month because he said he has now learned a lesson that making even 2% a month is much better than losing 1 crore in less than 1 year. When I asked him why he kept shorting – his answer was he was sure that like 2008 this was also a bubble and he can make a lot of money. Well that was speculation and not a plan. Plan can be of two types. 1. The stop loss plan: This is mostly done by the Future traders. If they take a 100 point loss – they take a 200 points profit. Loss to profit ratio for most is 1:2. That’s a plan. Its a different story that they may lose in all the trades. But at least on paper the plan is good. Because to be in profit they have to be 50% of the time correct. Test yourself and see if you are good at predicting the markets even 50% of the times then this plan will work for you. If its working stick to it for life. Do not change just because you think some other plan will bring more profits. You may have lost money to prefect this plan now do not switch because you will need more time and money to perfect another plan. 2. The hedging plan: Mostly done by option traders. In simple terms if you buy one option – just sell one option further away. Similarly if you are seller of option just buy options further away. Its simple and straight forward. It cannot do damage to your account whatsoever happens. With Futures too if you are selling you can buy calls and if you are buying you can buy puts. Agreed some profits will be eaten away but when wrong you will be safe. A few trades will not take you out of the game forever. In my view the hedge plan is better than the stop loss plan. So “Ride your winners and cut your losses is only this” – when you are making profits you should know where to stop. If you do not know where to stop then you have fallen for greed and will never make money. And if you are one of those traders who want to ride the markets for as long as possible then you should have a stop loss in the system which you should keep increasing with every few points move up with the indices. This “few” points is better known to you. That’s known as the trailing stop loss plan – but its only possible if you are trading full time. And again this is possible if you are trading intraday. How do you know what will happen to the markets the next day? If you don’t know and are leaving you trade naked, then again you have fallen for greed and not having a plan. Next day your 100 points profit can go into a 10 point loss or more. So if you are trading with trailing stop loss make sure to close the trade the same day at 3.15 pm and be happy with whatever profits you have made. If you think there is more to the rally – just hedge your profitable trade at 3.15 pm – that is a good plan. Remember this – share market is a serious business and only those who are willing to put some effort will make money. Just like any other business you need to plan it properly. You also need to get some education on options and futures on how they work and how you can use them as an arsenal to make money trading. There is no short cut to success. Similarly there is no short cut here. You got to work your way up – just like in your job. Those who are smart, those who can control these two emotions greed and fear and those who have a plan will almost always succeed in the stock market business. Thanks for the question Mr. Allen, and I hope I have answered what you wanted to know. Please ask questions I will gladly help. Many thanks for an excellent reply. Really appreciate the time and the effort you have taken to reply all about the emotions of greed and fear ….in such an elaborate manner. As much as it has enlightened me….I sure hope that your readers will take full benefit of the wisdom there is in the above article…and carry out their trades with a concrete trading plan as explained by you…and achieve the kind of success they desire. Glad that you liked. I will be happy if it helps even one trader to conquer greed. I will just add that the hedge strategy is better than the stop loss strategy, because it saves you overnight. Sir, I have a basic doubtâ€¦investing in a company shares for a long time gives huge wealth. But trading in options or futures the money made out of it is coming from someoneâ€™s pocket then is it morally a good trade? Is it not like a daytime burglary or pick pocket? Hope you will clarify my long time moral doubt. However trading in options or futures is morally and legally correct. To enter into this business we sign some legal documents – that document clearly specifies all risk is ours. It means when we make money itâ€™s our right to take it – and when we lose its our moral obligation to give it. When a trade happens both the parties involved enter into an obligation of business. One says the stock will move up (the buyer), and the other says it will go down (the seller). Now whatever happens they both know one will make money and the other will lose. When both parties are willing to put margin money to do the trade then itâ€™s morally correct to take your money when your bet was right. Remember you can lose as well, in that case you are legally and morally obliged to give your money to the other trader who won the bet against you because you entered the business obligation on a particular day – itâ€™s now time to honor that obligation. In fact itâ€™s done automatically by the broker for a small fee. Frankly no business is morally correct in the world. A cloth trader buys cloth for 100 and sells for 200 – making a profit of 100 in the process. Morally he should sell it for 100 as in your view this is â€œday time lootâ€ as the person buying does not know the real price. But the person buying knows very well that he has paid the merchant more than the price he bought the cloth for. Prior to buying, he knows that itâ€™s his business and he will make a profit – still enters into a trade with him – exchange a piece of cloth for money. Options trading is also a business where both parties involved know the risks. So when you make money there should not be any feeling of guilt whatsoever. You entered into a business trade and you won – so the money is yours – legally and morally. Hope I solved your dilemma and now you can trade with a free mind. It’s a very good explanation sir…yes no trade is perfect in this world. From the beginning of the history a trade is for a profit. So I’m somewhat convinced with that when a trade took place for a small profit. But if it goes against the ethics that the trade done for abnormal profit then its against morality. In your example too the trade done for profit though its high, there is an exchange took place. In share market also exchange took place by way of share for money and vice versa. But in options or futures market nothing exchanged except money. I.e. from your wallet to mine. Is it like a gambling? I.e. 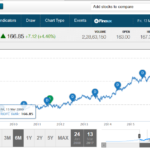 you’re saying nifty will go up and i say it will come down like India will win or pak will win…. I know these questions are not allowed or correctly answered in financial market. But i believe you may have that answer and it will channelize or reduce the greed within us. When you play roulette – the same things happen. Money exchanges from one wallet to another – from the loser to the winner. But no body forces you to play roulette. You know very well that you will either make money or lose. So please do not have any guilt when you trade – if you win the other party will have to hand over their money to you because that was the original agreement. And if you lose they will take money from you without any guilt so why you should feel bad? Trading is also a game in a legalized market where there has to be a winner and a loser. That is how this business works – there is no place for guilt. Hope now you got your answer.